A Florida woman was charged with 157 counts of animal cruelty after authorities discovered the horrendous living conditions at the animal shelter she was operating. Police were led to the facility after animal control complained of possible abuse. “Animals were found to be malnourished, had little to no vet care and were infected with numerous diseases including heartworms, hair loss, open and unhealed sores, dehydration, mange, diarrhea, flea infestation, bad teeth, root exposure, and extreme weight loss.” Mascara said. Of the 157 animals that were liberated, 16 dogs were in such poor condition they had to be euthanized. 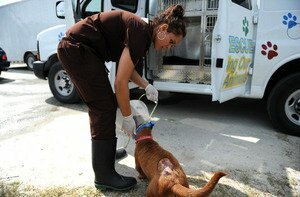 “Just imagine what it would be like to be outdoors in the heat day and night and to have to fight for your food and basically get no care,” Dr. Sara Mathews, co-owner of Dr. Dan’s Animal Hospital in Vero Beach, says. “That was the tough part.” She says it’s likely the animals didn’t have proper care for several months. Matthews and her husband, Dan Clifton, adopted one of the animals rescued from the shelter – a dog named Lion King. Sanctuary Animal Refuge’s operator Palena Rae Dorsey, 59, was initially arrested in February of this year and charged with first-degree grand theft, as she allegedly stole more than $250,000 from the shelter’s $500,000 trust fund. She’s accused of using the money to purchase several personal items, including a home, automobiles, and merchandise from QVC and the Home Shopping Club. The state attorney’s office hit Dorsey with the additional charges – one for each animal that suffered at her shelter – Thursday morning; if found guilty on all counts, she could spend the rest of her life in prison. Dorsey’s being held on a $150,000 bond.